It’s hard to think of the need for sun protection when we have snow on the ground, but spring really is just around the corner (I sound like Ma in [amazon_link id=”0060581859″ target=”_blank” ]The Long Winter[/amazon_link]). Although the sun is good for people, and sunscreen blocks vitamin D absorption, as well as contains cancer causing chemicals, sun protection is necessary for extended periods outdoors. k & j Sunprotective Clothing is a chemical-free, cotton line of clothing for infants and toddlers that provides UPF 50 protection and blocks 99% of the sun’s rays. 1. Sun protection should begin at birth, however sunscreen should not be used until after 6 months of age—making the first few months of life an ideal time for sun protective clothing. 2. One blistering or five non-blistering childhood sunburns double the lifetime risk of developing melanoma, a potentially fatal form of skin cancer. 3. The development of skin cancer has been linked to both intensive (beach, pool) and non-intensive (daily outdoor activities such as playing in the backyard or at the park) sun exposure. In fact the sun’s harmful UV rays can come through the windows in your home or car! 4. 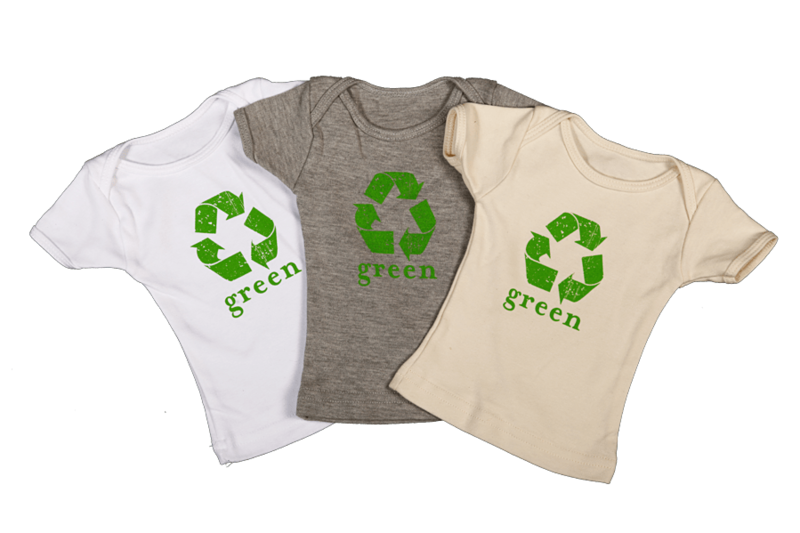 Standard cotton tees do not provide adequate protection from the sun during daily play or time at the beach. We were sent a green t-shirt. It is very soft and cute. It is short-sleeved, so your child would still need some protection on their arms. Would I buy this product? Probably not. It is $22. For that price, I would expect the shirt to be made from organic cotton. It’s been awhile since a product review has caused so much excitement in my house! Magic Bean Wishes Fortune Telling Kit is a unique idea that embraces the fascination children have with the [amazon_link id=”B00001ZWV7″ target=”_blank” ]Magic 8 Ball[/amazon_link] and the classic story of [amazon_link id=”0688152813″ target=”_blank” ]Jack and the Beanstalk[/amazon_link]. Each bean is imprinted with fortune telling words (“Doubtful”, “Not At All”, “Definitely”, etc). Three beans are planted in a peat pot, and whichever one sprouts first, is the answer to your question. Discover what your future holds! Fortune Telling magic beans have all the answers. 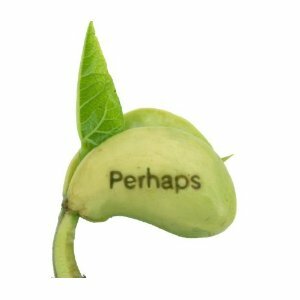 Simply plant one ‘yes’ bean, one ‘no’ bean, and one ‘maybe’ bean in the same pot—the first bean to sprout will reveal your fortune. Package contains nine beans, three peat pellets, and three environmentally friendly coir pots made from coconut husks. Beans are a classic plant grown in preschools and kindergarten classroom because they are so easy to grow. Combining fortune telling with this classic early childhood activity is genius. It ensures children of any age will tend to and check often to see if their beans have sprouted and told their fortune! Would I buy this product? Yes. I think this would make a unique birthday gift, and it is not too expensive at $12.95. You could copy this idea by simply planting regular beans in pots and labeling each pot yes, no, or maybe, but the imprinted words are unique. My only concern is the beans appear to be dyed. My daughter asked if we would grow the beans to eat, but I told her no because of the colorant. 3. Aqueduck Bathroom Faucet Extender ~ Helps Kids Reach Faucets! Sometimes, it can be awkward for little hands to reach the faucet, and washing hands is an important part of toilet learning. Aqueduck has a BPA-free, PVC-free, phthalate-free solution. As my kids grew bigger and heavier, they became harder to pick up to wash their hands. I wondered if there was anything to help them reach the water faucet. I could not find anything and stools are not portable, so, I decided to come up with a solution. That is how the Aqueduck was born. Would I buy this product? No. I personally prefer a [amazon_link id=”B0000CF4T4″ target=”_blank” ]wooden stool[/amazon_link] to help my children reach the bathroom sink. True they are not portable when going out to eat at a restaurant or using a public restroom, but I really don’t think I would carry around the Aqueduck. It would be too wet to just throw in a purse or backpack after use, and it would pick up germs from public sinks. Also, I try to avoid unnecessary uses of plastic, BPA-free or not. Plus, did you know there is a certain level of acceptable “non-food” ingredients that turn up in jarred baby food? Guess what kind of things these “non-foods” include? Bug parts, rodent hairs, rodent droppings and more. DISGUSTING! These non-food ingredients are an acceptable standard in the food processing industry, but it’s quite different when you think about them being fed to YOUR tiny baby. I am turned off by Baby Bullet’s website. The video ad sounds like a TV infommercial, complete with buy one, get one free. Besides, the Baby Bullet comes shipped in an extraordinary amount of styrofoam. 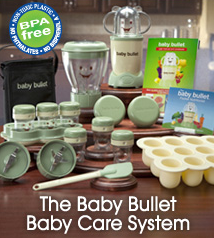 Baby Bullet may be made from non-toxic plastic, but it sure has a strong odor out of the box. Would I buy this product? NO. It’s expensive ($79.95), it’s plastic (BPA-free), and it is not necessary. You don’t need a separate blender to make baby food, and a [amazon_link id=”B000067Q6J” target=”_blank” ]hand mill[/amazon_link] works well. I am always envious and admire parents that travel abroad with their children. It’s something I hope to do when my children are older, but I have to admit I have a lot of anxiety about the idea. Feel the panic of losing track of your family in the narrow streets of Bangkok or the exhilaration of curling up with a tiger at a buddhist temple. Learn the true meaning of culture shock and understand the essence of hospitality. Indulge in a pizza contest that ranges across the United States and the world, and experience a safari that brings aggressive monkeys through your window. Come to grips with the end of a great adventure as you settle back into the mundane. The phrase what a difference a year makes took on a new meaning for the Boesch family. In May 2007, physician David Boesch and his family five strong, with kids age 7, 10, and 13 embarked on a trip that would bring them to 6 continents and 17 countries in 345 days. 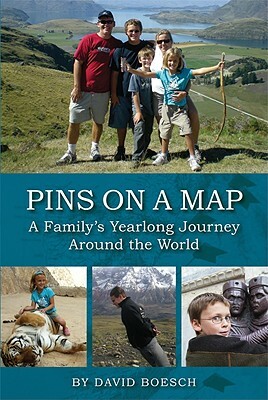 Boesch depicts the adventure of parenting in constant motion in Pins on a Map, a riveting, honest, and heartwarming memoir. Safety, education, logistics, limitations, and respect are just some of the themes that resonate in this amazing-but-true story an enthralling account of parents giving their children the experience of a lifetime. Interspersed with history, and sprinkled with humor, Boesch lets readers tag along on an unforgettable family journey that forever changed perspectives of the world and their place in it. Perhaps there is less anxiety when one of the parents is a doctor. I just can’t imagine traveling a whole year with my kids; we would all be different by the end, and for the better. I remember as a child being amazed by my friends’ stories of adventures in foreign lands. I can’t imagine what kind of tales the Boesch kids tell their peers. Would I buy this book? Probably. I have only read a few chapters, not cover-to-cover, so I can’t whole-heartedly endorse. I think the writing is a wee bit awkward, but not to the point of distraction. Glad to see your review about the baby bullet. I just saw a commercial for this last night. I thought it was pretty expensive also.